Now days CJ is getting interested in Hopscotch game! So I wanted to make a indoor Hopscotch play mat for her. In one of my previous posts, we had upcycled half portion of a toysrus multipurpose blanket to a Tape road Play mat. This weekend CJ and I converted the other half to a hopscotch mat. 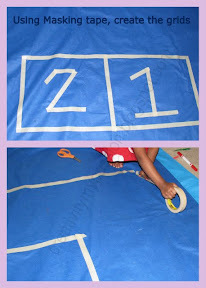 We used masking tape to create the grids and the numbers. As I had mentioned in my previous post, tape road play mat, the advantage of using blanket is after the hours of play we can roll it up or fold it and get it out of the way temporarily. Especially for the people like us who leave in apartments and have space constraints. When the blanket gets dirty, you can peel off the tapes, wash it and make a new one. It's a good counting practice rhyme. You can also make your own Count down Phrases too and have fun. Read and Do the action game - Place small pieces of paper/Strips of paper with a word of action in each grid. Let the kid read it out and do the action. March is National Reading Month and we are also reading Hop on Pop by Dr. Seuss. Brilliant what a great way to have lots of fun - singing, counting, jumping and of course making (to begin with). This would really help my son with his number recognition! What a great idea!!! Now you can play it inside too! I played this game a lot with my cousins as kid. Great way to play it inside! Esther, I love your creativity! Your projects always make the child in me (and the adult too) smile! Looks like lots of hoppy fun! We would love to have you link your creative post to our Show and Tell feature if you are interested. This looks like lots of fun - and a great indoor way to get some exerise on a rainy day too. Thanks for sharing with the Play academy! I'd love for you to link up this post to our new "It's Playtime" party today! Thanks for stopping over and linking this up to It's Playtime this week, I hope to see more of your ideas next Thursday too! I'm back :) I'm gonna feature this MOVING idea on Friday with a huge round up of ways to get kids moving. Come by on Friday and check out all the other features -- I'm pretty excited about this round up of energy busters!